Cats can drool for any number of reasons. Drooling is not as normal in cats as it is in dogs so it may often be a sign of sickness. If you detect unwarranted or unusual drooling in your cat, take her to the vet. When a cat is relaxed or in a state of bliss she may drool in small or large quantities. Often these cats have drooled since kittenhood. Being massaged or petted can be a factor in excess salivation. Most cats like to “knead” or “make biscuits” with their paws when they feel intense pleasure but some may drool instead. To determine whether your cat is drooling from pleasure context is important. Is it a normal behavior? Is your cat eating, sleeping, and playing as she normally would? Making certain other odd behaviors aren’t accompanying the drooling is helpful in evaluating your cat’s health. 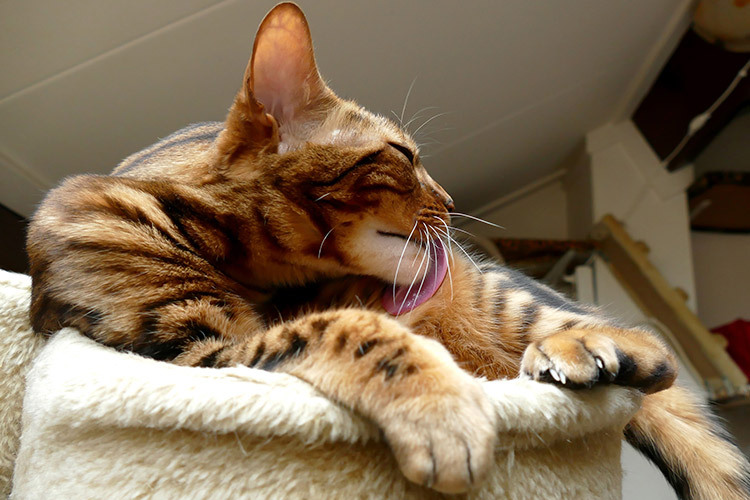 A cat who starts drooling with no previous similar behavior may have a health issue. The severity of the issue can’t be diagnosed without the guidance of a medical professional. Some causes are mouth pain or injury, cancer, poisoning, organ disease or failure, or ingesting foreign objects. Dental diseases aren’t initially serious but will lead to life-threatening problems if left untreated. Many houseplants can cause poisoning thus bringing the onset of drooling. If you have any houseplants, do a quick online search to verify their toxicity. Similarly, your cat may ingest corrosive agents such as cleaning fluids if you are prone to leaving them in reach. Cats also like to play with or eat small prey but many of these little creatures can cause illnesses. Outdoor cats are prone to injuries from trauma whether from another animal, human, or vehicle. Roaming around outside there are too many objects that cats will find interesting. There is so much danger out in the real world – glass shards, sharp metal, and enemies. Your outdoor cat who has started to drool could have been injured by any of the above. Try to check her mouth for sores or cuts. If you suspect she ate something, take her to the vet immediately. Glass shards or pieces of sharp metal can perforate her intestines. Cats have been known to develop squamous cell carcinoma often in their mouths. This cancer also can be found in their eyes and ears. There are many vague symptoms of this type of cancer but it is usually in conjunction with bad breath and a perpetually opened mouth. Because a cat with oral squamous cell carcinoma cannot close her mouth, she will drool excessively. Kidney disease is a very common ailment in cats. When the kidneys start to malfunction an accumulation of waste products in the bodily fluids will start to cause mouth ulcers. This is most certainly a reason to make a trip to the vet as soon as possible. Drooling is not a sickness in itself. Looking at the surrounding circumstances is key to making sure your cat is happy and healthy. The best thing to do even if your cat is not drooling is to regularly check the inside of her mouth. Look for redness, swollen gums, decaying teeth, or lesions – these are goods way to examine her overall well-being. Canidae: Why Do Cats Drool When They’re Happy?